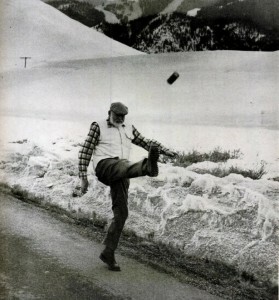 Life Magazine’s retrospective of Ernest Hemingway in the July 14, 1961 issue has a picture of Hemingway kicking a can of beer. Hemingway said the picture was his favorite. He would kick the can again for good within a year, shooting himself as his father had done. Hemingway’s idealized life came to an end with one more fictional tale. This one was of how he died. The New York Times reported his wife’s claim that the double barreled shotgun aimed at his temple was accidental. The first news accounts were that Hemingway died while cleaning his favorite gun for shooting pigeons. “But man is not made for defeat,” he said. “A man can be destroyed but not defeated. The advertisements in Life proclaim that General Motors leads the way, with help from Standard Oil, good tobacco, shiny new refrigerators, and Tang to start your day. Hemingway has to share the issue with William Faulkner who types with two fingers and insists with a “mustache that doesn’t smile” that he is strictly an amateur writing with no set schedule. De Gaulle is busy with an Algerian problem. The picture of the week is Krushchev getting “corny” with Iowa farmers. A “frank” documentary is out about breast cancer and a new Zenith radio fits in your pocket. Big glossy ads for martinis and Kool-Aid, America’s best loved instant drink, will help you and the kids get through the week until the next issue of Life. Letters to the editor cover a wide range of subjects, from increased cheating in the classroom to the story of several hundred women amputating their toes to wear pointed high heel shoes. One reader challenges the Life story that one third of the 1936 graduating class at Smith College received psychiatric counseling. The Smith girls counted marriage and family counseling as part of their psychiatric cases so the number of Smith girls truly cracking up was less than 33%. British tanks have moved into Kuwait to protect it from Iraqi threats of invasion while Jimmy Hoffa is crowned Little Napoleon of the Teamsters. The Arab world “shudders” at news reports of Israel testing rockets rumored to be for nuclear weapons. Sixty percent of Americans are willing to use nuclear weapons if necessary to defend Berlin. General MacArthur has returned to the Philippines to celebrate the anniversary of its liberation in World War Two and receives a big kiss from Miss Philippines. Finally, the pages turn to Hemingway and his “Enduring Passion- the Gift of Death.” The true account of Hemingway’s suicide is not publicly confirmed. Life celebrates Hemingway’s criticism of dying “badly,” with an oblique reference to Hemingway’s death seeming to be no accident. Hemingway’s life was dedicated to physical violence, scarring him physically and mentally. Archibald MacLeish writes that “memories must become blood within us” and this is Hemingway’s greatest triumph. Intensity of experience must become so great that it contains our being, enabling us to learn who we are, and keep us dreaming “about the lions” as Hemingway said at the end of The Old Man and the Sea. The girls of Smith College have joined the hunt.